Check out this Beauty ~ Yes, that's the Listing Price! Welcome home to the largest Ryan model in Rivercrest! This beautiful Oberlin floor plan is perfect for entertaining with upgrades throughout! Upon entry, gleaming hardwoods and opulent crown molding that stretch to the living room and dining room are sure to set the tone for luxurious standards to any guest. Entertain with ease with Stainless Steel appliances, Granite counter tops, large center island, with Kitchen open to breakfast nook, family room, and French doors to private backyard. Work from home? 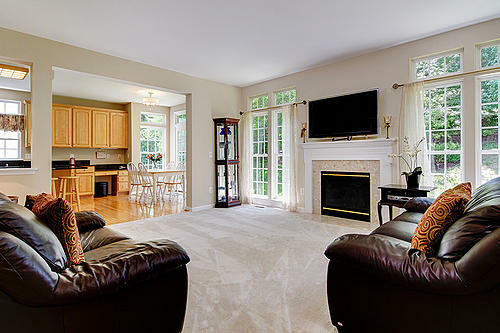 Utilize the perfect main level study as a peaceful home office just off the family room. At the end of the day, retire to the upper level complete with new carpeting and 4 spacious bedrooms. The Spacious Master Suite awaits with His & Her closets and Luxury bath with soaking tub. Let your imagination run wild with the clean slate lower level including rough-in just waiting for your touch! Opportunities like this don’t come around often so get your tour today before it’s gone!